Valentine's Day is fast approaching and in case you are thinking of getting jewelry for your Valentine, please lay off the diamonds this time. We always gift our loved ones with something special and rare as an expression of love, and to convey that we have a special place for them in our lives. 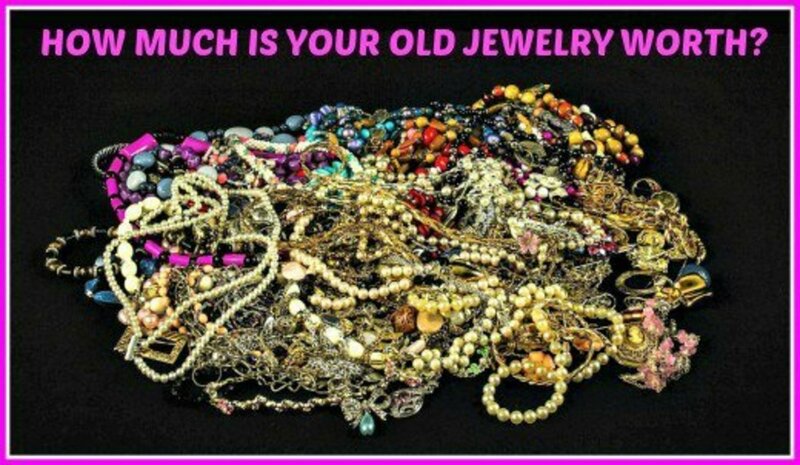 Usually it is in the form of jewelry such as diamonds, gold, platinum, rubies, emeralds, or sapphires. While the limelight of precious jewelry is often stolen by diamonds and platinum, which are quite expensive due to their luster and shine, we must understand that there are things much rarer than these. Have you ever heard of cosmic jewelry? Cosmic jewelry is mostly made from pieces of meteors and asteroids. Meteorites are both rare and unique. They are not naturally formed anywhere on earth and their only source is space. 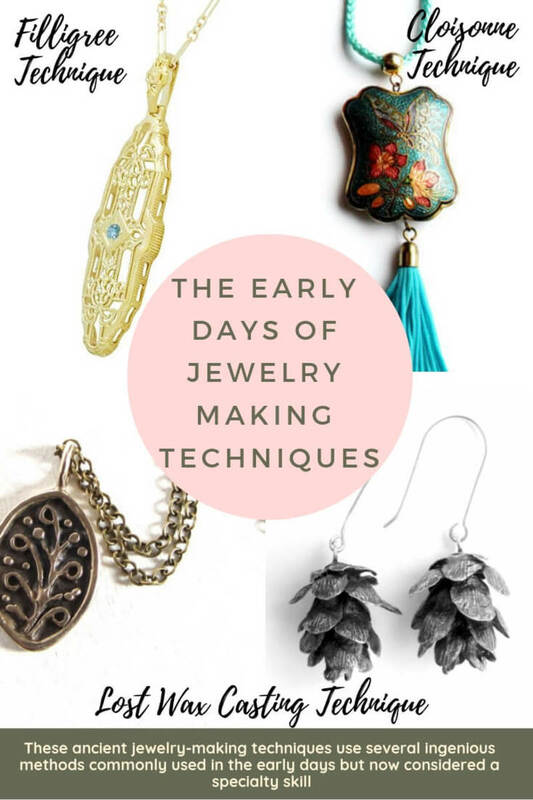 Even though there are thousands of meteor showers and landings in a year, only a small percentage of these are fit for incorporating into jewelry. This is because there are many different types of meteors and most of them are not jewelry quality as they just look like any other stone on earth. However, there are specific types of meteors which are perfect for turning into precious stones. There are basically three different types of meteorites: stony, metallic, and a mixture of stony and metallic. The stony meteorites are comprised generally of silica and a little metal, mostly being iron. Metallic meteorites are mostly comprised of iron and small portion of silica, nickel, cobalt, or other metals in minute proportions. The third kind, being mixture of both stone and metal, is where things get interesting. These stony metallic meteors contain sandwiched layers of olivine in a matrix of iron. Olivine is basically magnesium iron silicate, which is common on Earth, but people, the olivine in meteors is certainly not of this Earth! These olivine meteors are well known as pallasite meteors and are the most expensive and highly sought after type. These are perfect for making jewelry due to their beautiful sea green glass-like structure, coupled with the metallic sheen of iron. 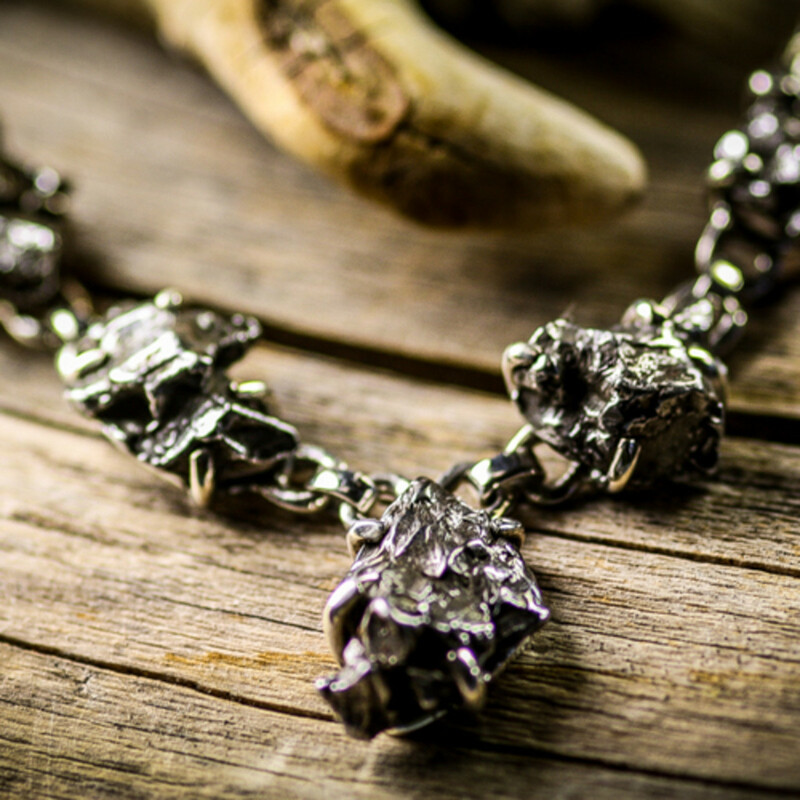 Almost all valuable meteorite jewelry is made from pallasite. However, even iron meteors are used in jewelry and unlike pallasite, they may not be expensive as they are comparatively more common. This simple, crude-looking stone is actually a part of a meteorite known as Campo Del Cielo, which was found in Argentina. It is an iron meteorite and therefore heavy. 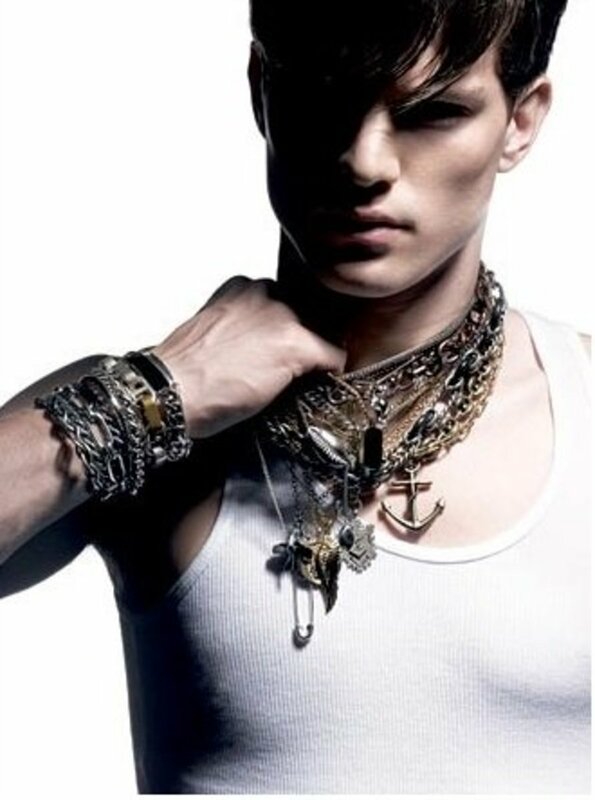 The chain is simple and non-symmetrical but at the same time it is quite eye-catching. Several people have asked me about the chain. I have been wearing it for the last two years and it is just amazing. You certainly get a sense of uniqueness when you walk around with a stone from space around your neck. Do not wash in water or expose it to excess moisture. Being iron, it can rust if exposed to water. I have found it to be a great conversation starter, too. Just like true hunger, which knows no taste, real beauty does not require symmetry. 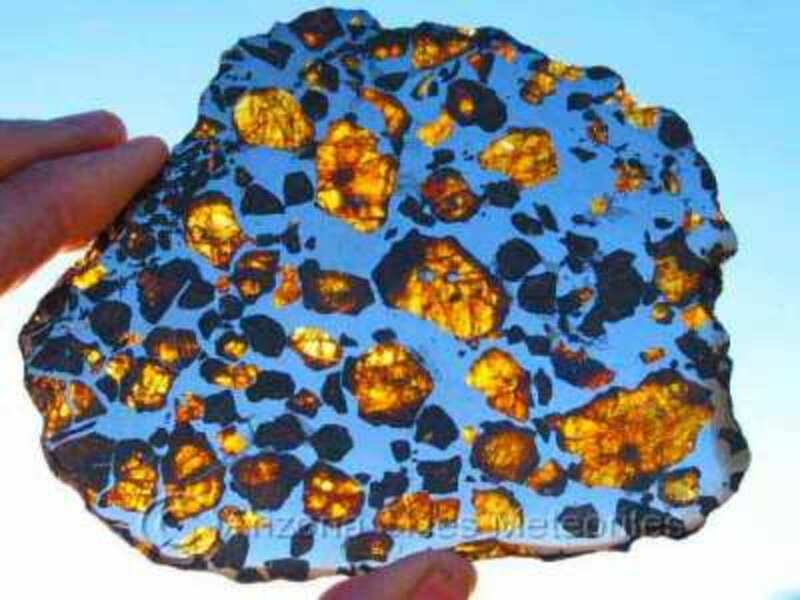 As you can see above, the beautiful structure of pallasite has led to its establishment as the king of meteors. Some of these are so beautiful that they command a price of $10 or more per gram! That's right. They are highly sought after by both meteor collectors and cosmic jewelers. 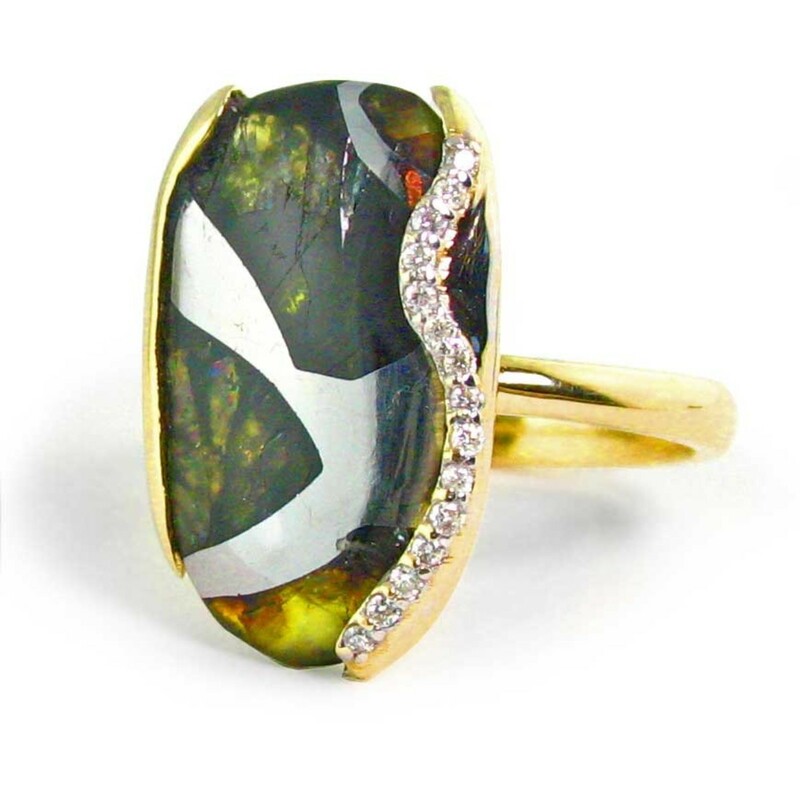 Pallasites have been turned into lockets and rings, and even bracelets. Trust me, they will certainly catch the eye of most people. Sometimes I wonder if pallasite is behind the idea of Kryptonite. If so, don't worry, it is quite harmless to us humans. 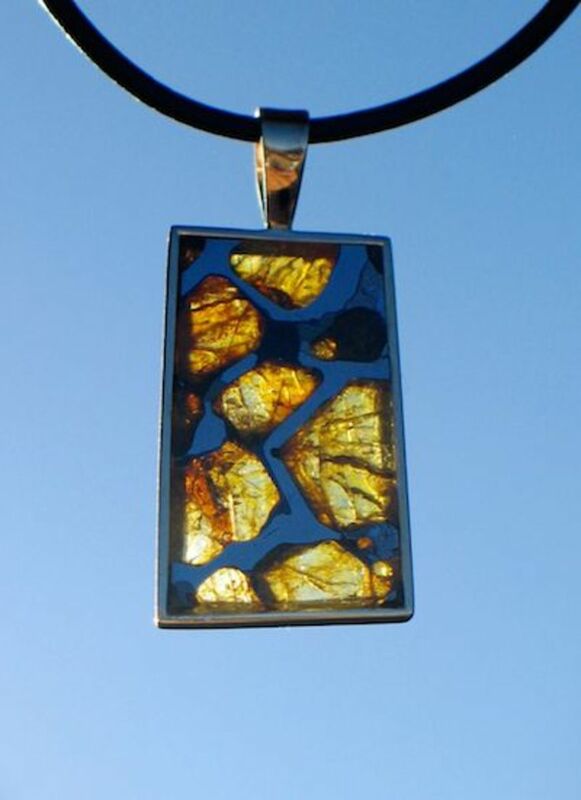 There is no condition that all cosmic jewelry should be made from pallasite meteors alone. Other stony and metallic meteors are fashioned into jewelry, as well. These are often not cut into symmetrical shapes or polished. They are incorporated into the jewelry in their natural state and shape, so as to add a sense of genuineness and uniqueness to the piece. However, the price of these jewelry depends more on the craftsmanship rather than the piece of meteor itself. Even then, they will be a class above traditional jewelry, as they can still be rare. My precious... Yes, you bet. If that ain't precious, I seriously don't know what is! 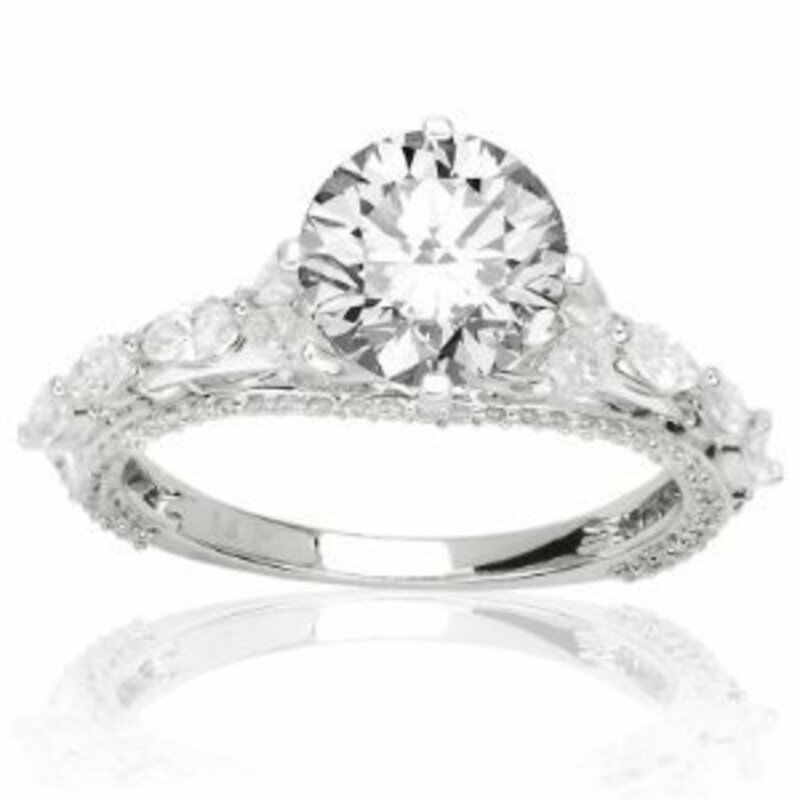 I hesitated a lot before buying this ring because of the price, but have had absolutely no regrets ever since. The ring is heavy and is beautifully crafted. The meteor part of it is set on the top while the rest of it is sterling silver. 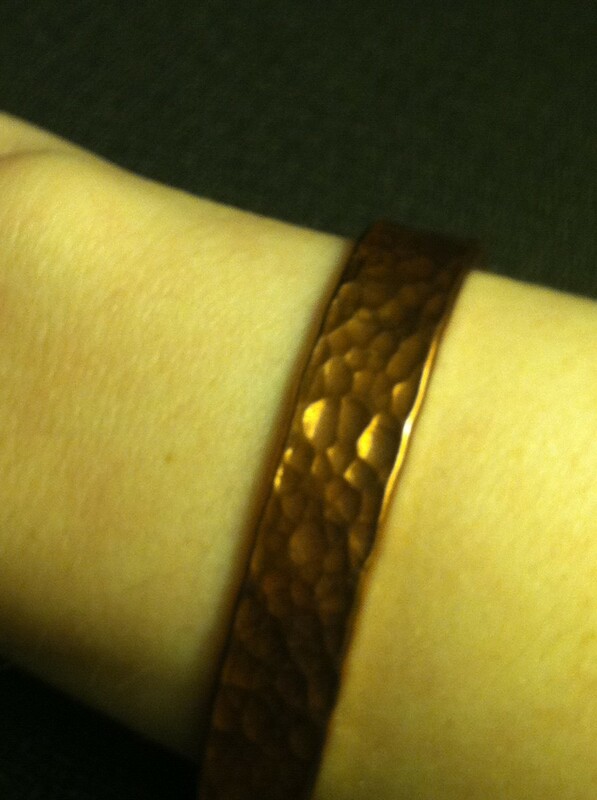 One of the things to watch out for in cosmic jewelry is rust, since iron is the most dominant metal in the meteorites. In order to prevent that, the ring comes with a coating on top of the meteor stone. This is really helpful, as I don't have to be careful about exposing it to moisture. Also, it comes with a certificate of authenticity linking it to the Muonionalusta Meteorite, which was found near Sweden and is reportedly around one million years old. The patterns on the stone are quite clear and profound, too. This is the best piece of cosmic jewelry that I own. What makes cosmic jewelry so awesome is that it is made of something that is literally out of this world. And the cost is not that high either. 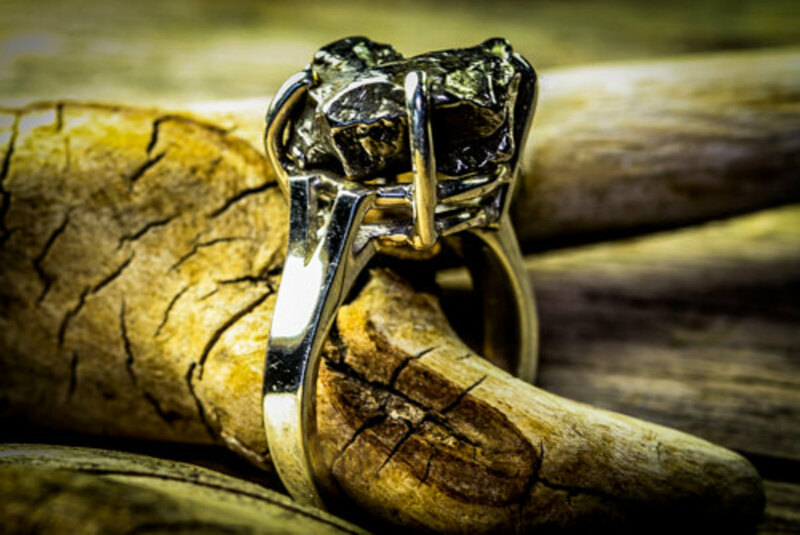 The price of a pallasite pendant or ring is not even close to the price of a diamond engagement ring. Besides, the beautiful patterns you see on the stone are not man made. 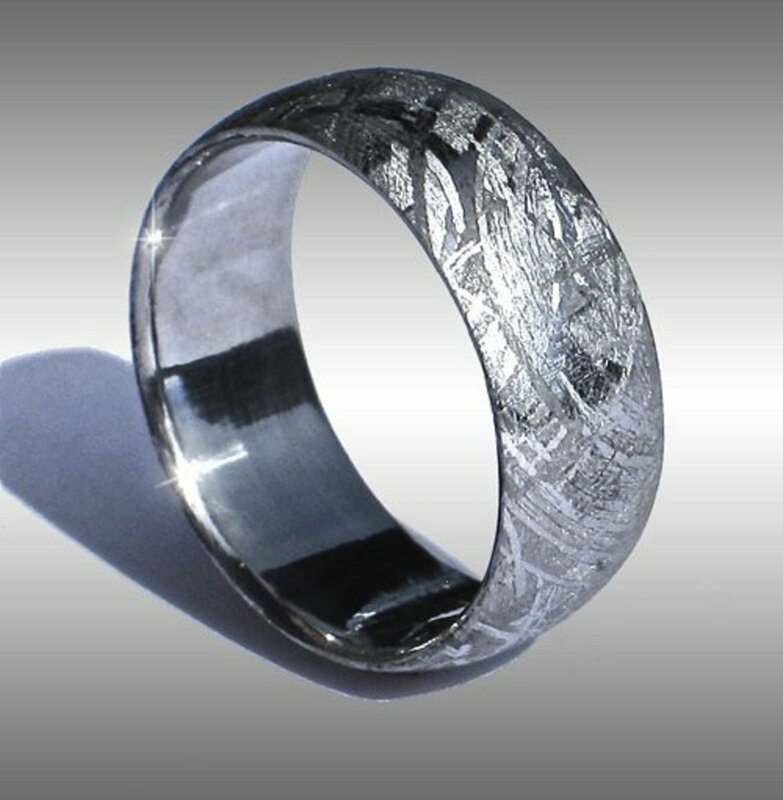 Those intricate contours of metal on the stone are actually naturally occurring iron in the meteorite. In fact, the stone itself is not modified in any manner. Unfortunately, the color choices are limited to slight variations of green or light yellow. But color hardly deters determined people who are intent on wearing a piece of the universe that traveled millions or billions of miles to reach us. Branham Kansas - Meteorites of masses in excess of 1000 kg found. Used in cosmic jewelry. Fukang China - 1003 kg. Used extensively for pallasite jewelry. Imilac, Chile - Up to about 920 kg found. Seymchan, Russia - Slices used for both collections and jewelry. There is no better way to convey to your loved one that they are special than by gifting them something that is otherworldly, like cosmic jewelry. 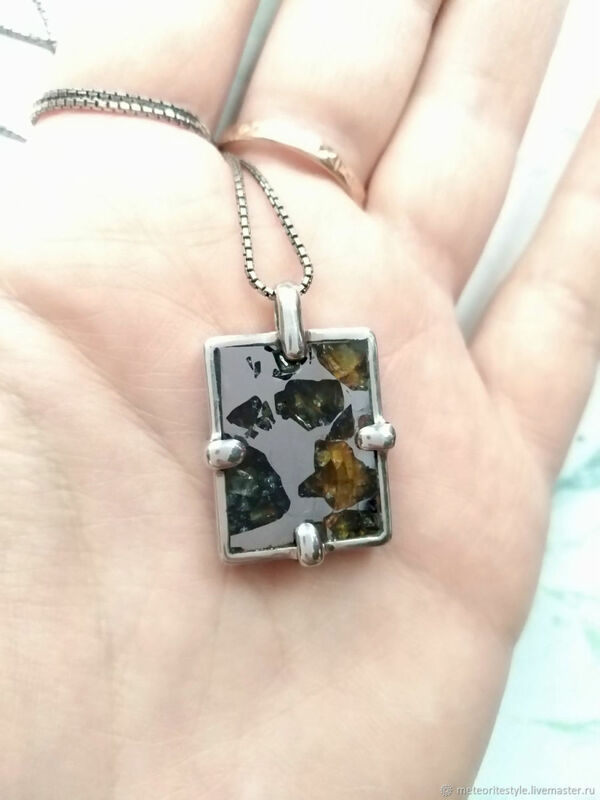 You must note that the sources for pallasite jewelry are quickly drying up, as there are only a limited number of pallasite meteors remaining unexploited on Earth as of now. The demand and desirability of these pieces only goes up and cannot come down. Make this Valentine's Day special by gifting your loved one a piece of the universe.